Tanning the safe way. Yes, that is me with a tan. About as tanned as I get anyway! 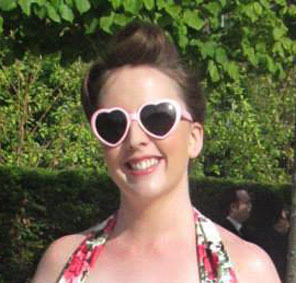 My complexion is very much ‘English Rose’. At least, that’s how I like to think of it, it sounds better than ‘pale and pastey’. I humbly admit that, yes I did, twice in my life, visit the sunbeds, but that’s just not for me. Why run the risk of such nasty diseases when it’s so easy to fake it? I’ve spent the last few years trying out different tanning products. Most of the one’s I’ve tried are really good, but sometimes there’s a bit of a smell to then which lets everyone know you’re faking it. As we all know, the whole idea is for people to believe you effortlessly look that glamorous and so I personally prefer ones without an odour. This summer I’ve been trying James Read’s Bronzing Mousse Instant and James Read’s Bronzing Spray Instant. There’s very little odour with these both, which is a plus, but each one has it’s own separate benefits also. 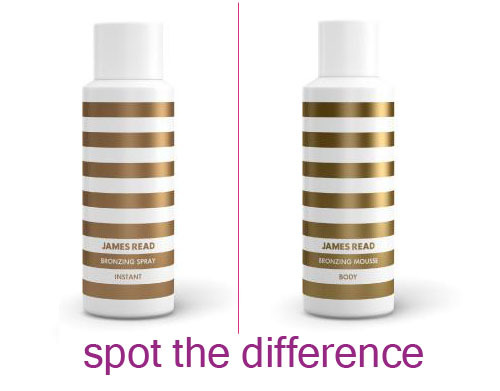 James Read Instant Bronzing Spray and James Read Instant Bronzing Mousse. Or is that the other way round? Firstly, the bronzing mousse has an amazingly soft texture. It feels like clouds on your skin, seriously! Once applied, you leave it for several hours before showering (I left it overnight). The colour is instant, so great if you’re in a rush before a night out, or in my case, a wedding. However, once you have showered, the colour calms down leaving a very natural looking tan. Of course, you can build up more layers as desired, but I like to still look natural. The downside to this is you need to be quite fast in application as the mousse is instant. If, like me, you place a dollop on your legs and then spread out from this dollop, you will be left with a dollop shaped tan line. A few applications later and I’ve mastered it. It’s just a case of practise. Also, you will need a tanning mitt with this one as otherwise you’ll end up with tanned palms. Never a good look! The bronzing spray, similarly is instant. This would help newbies to the self-tanning world no end as you can see instantly where you have covered and how deep your tan will be. As it’s a spray, there’s no mitt required, but the downside would be that you need to protect your floor against the spray. Not really downside enough to put me off buying a product, but that’s about as negative as I can be about this. For me personally, I found the spray more difficult to use, perhaps again this is just lack of practise, I’ve never used a spray tan on myself before. For this reason, I used this product in advance of any occasion, so I had time to correct any mistakes I might make. Overall, I think when buying again I’d opt for the mousse. It’s just personal choice really, but I just love the feel of it on my skin. This entry was posted in Product Reviews and tagged James Read, Self-Tan, Tan, The Look To Die For. Bookmark the permalink.